IROKO Theatre's artistic director Alex Oma-Pius appears in the Evening Standard. February 22nd. 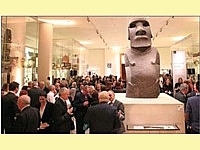 Alex attended the Evening Standard's special evening at the British Museum. The event was held in celebration of a collection inspired by London's diverse communities. Alex is quoted in the Evening Standard saying, "You might go round and see a mask and it's just a mask, but coming as part of a group, going round with someone who can explain it further, then it is no longer a mask."